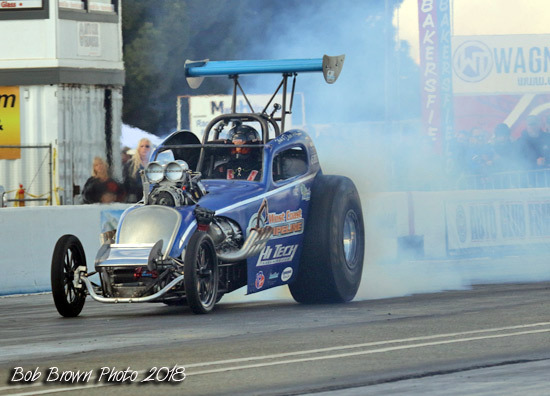 Pair two featured Chris Bennett in the High Heaven III '32 Bantam and Todd Miller in Dave Hix's '37 Topolino. 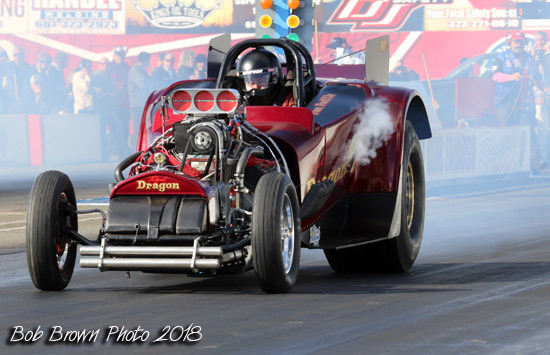 Up next was Tom Padilla in the "Red Dragon" '27 Ford and Rodney driving his '23 Ford, "Godzilla"
With 14 cars vying for 8 spots, out next was Eric Gates driving his '23 Ford and Brian Hope driving Rich Guasco's "Pure Hell" '32 Bantam. 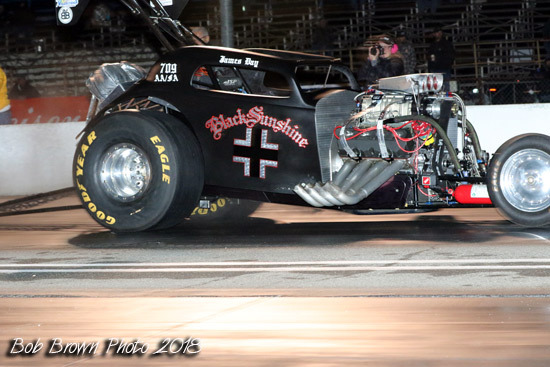 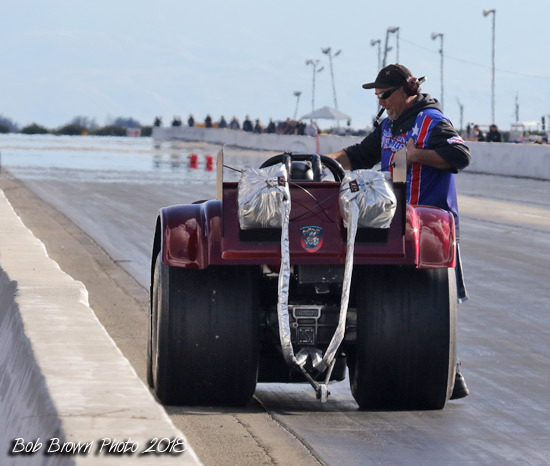 Out next was Keith Wilson in his "Witch Doctor" '48 Fiat and ???? 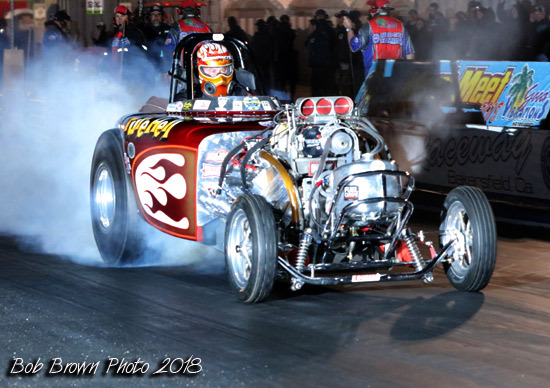 Next out was versatile driver James Day making his AA/FA debut in the "Black Sunshine" '48 Fiat and Shane Harter in the "Lil Nate" '32 Bantam. 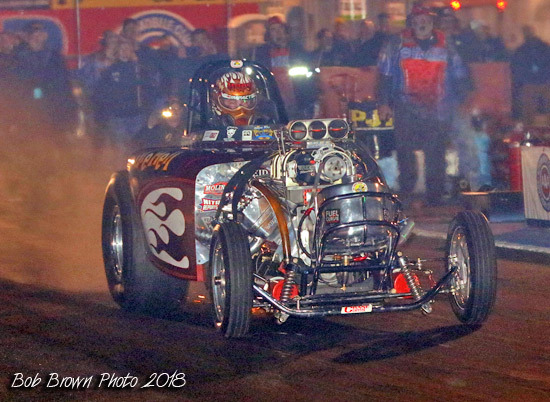 Up next was defending champ Dan Hix in the "Heat Seeker" '34 Chevy and Mark Whynaught driving his '23 Ford. 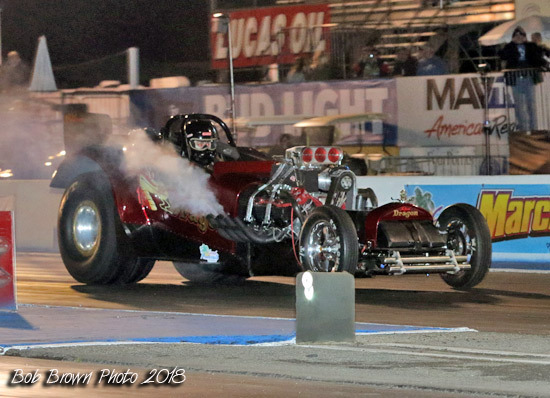 The final car to take a shot at the clocks was Robert Winefsky in the "Coyote Express" '32 Bantam. 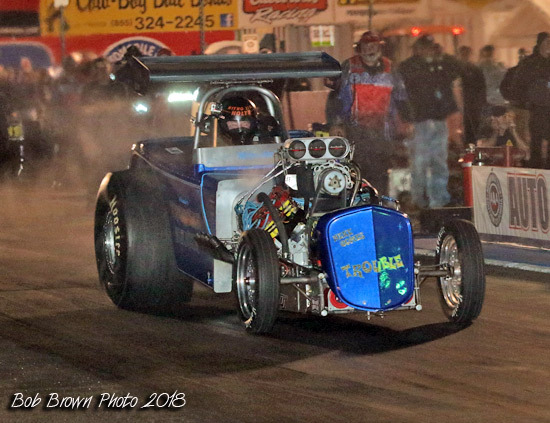 '23 Ford. 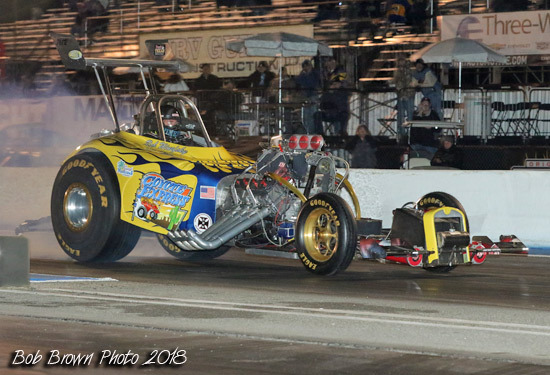 His intended opponent was James Generalao in Impatient who backed out and towed through for some reason. 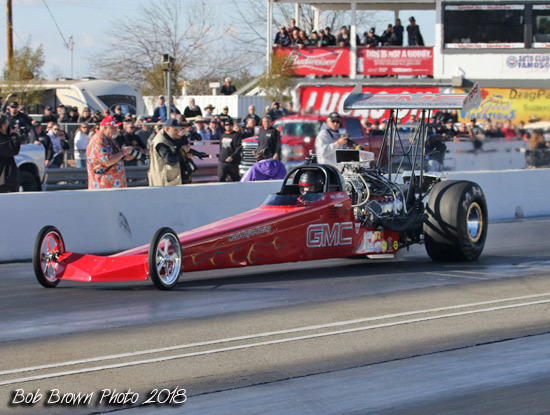 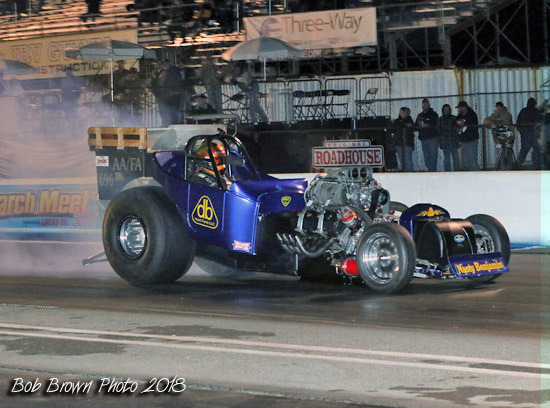 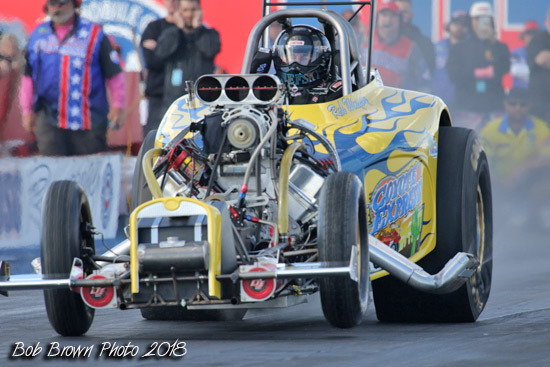 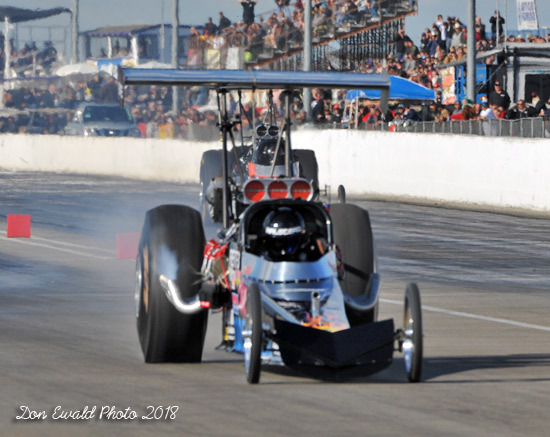 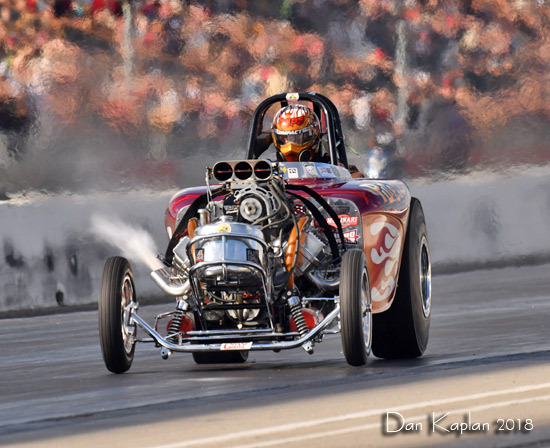 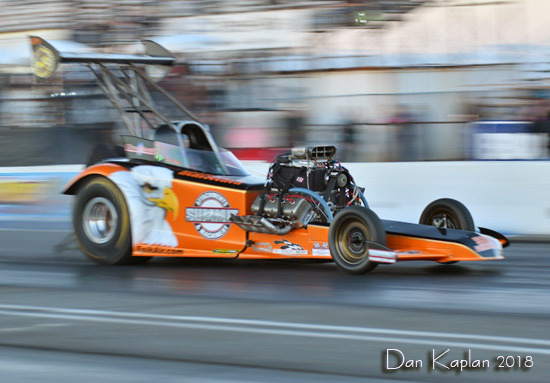 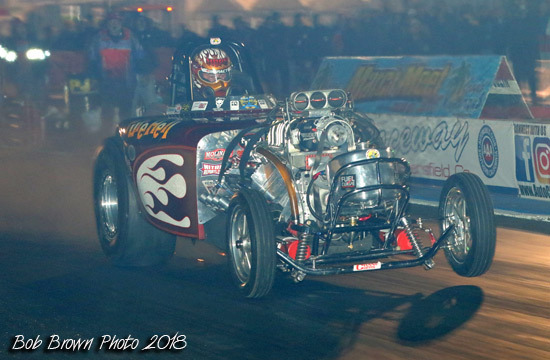 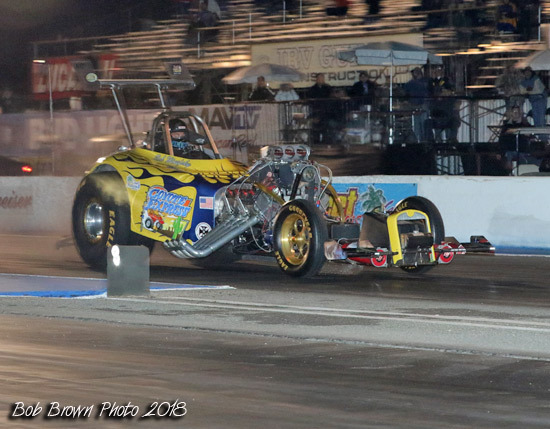 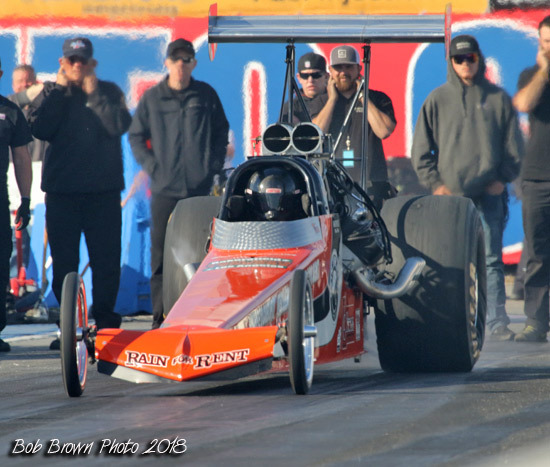 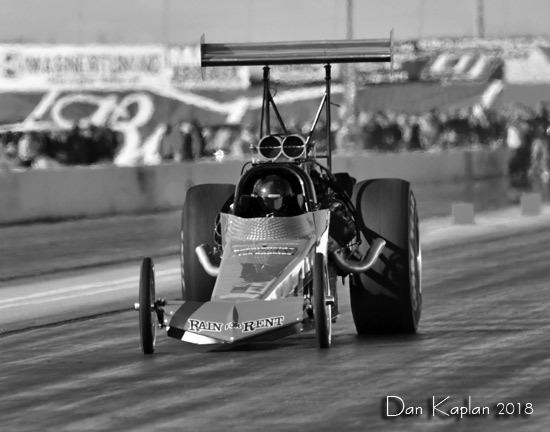 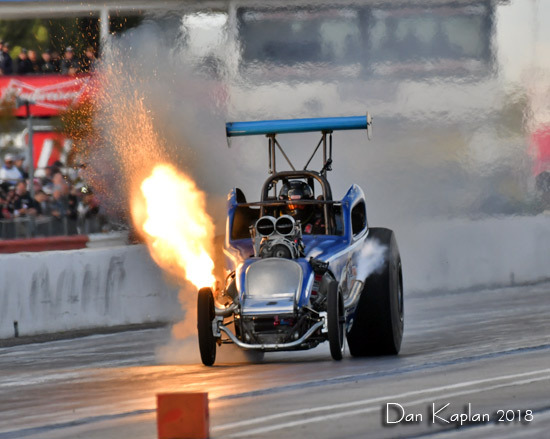 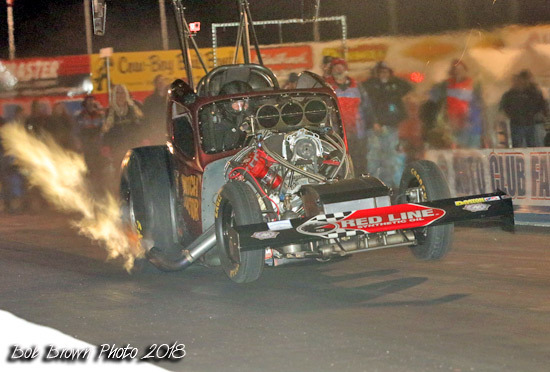 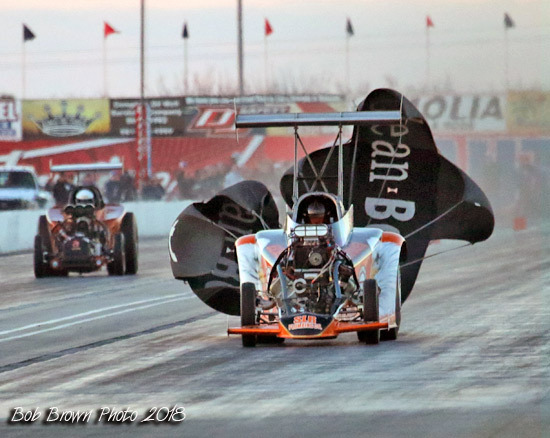 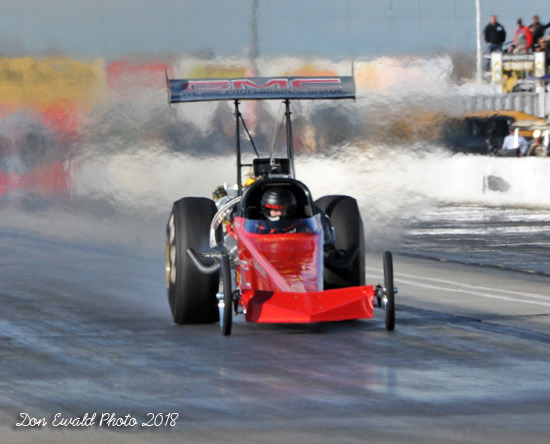 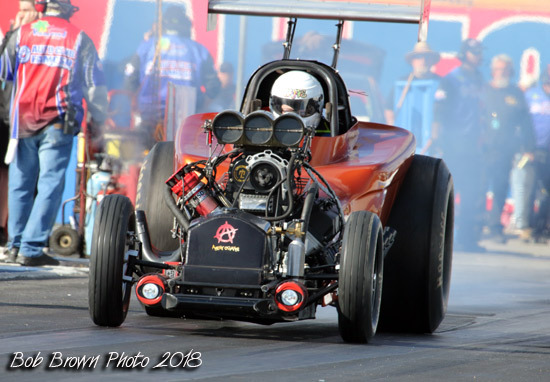 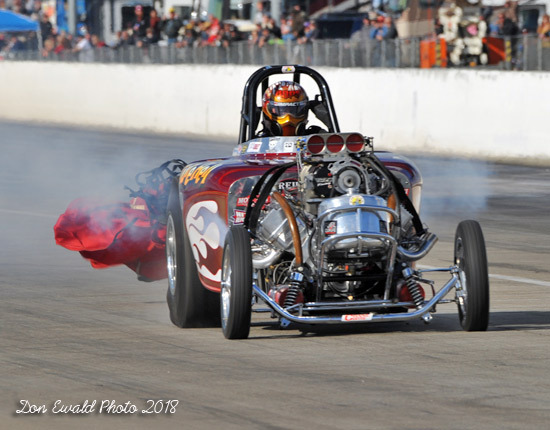 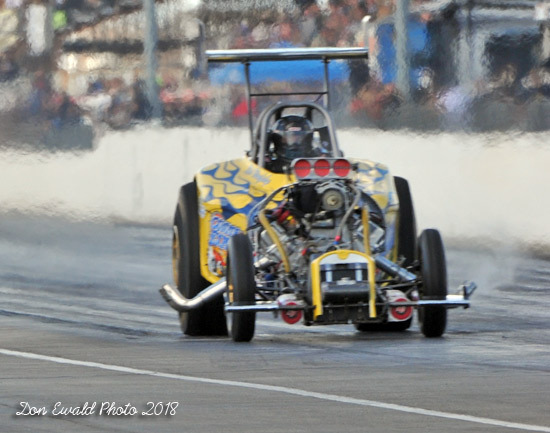 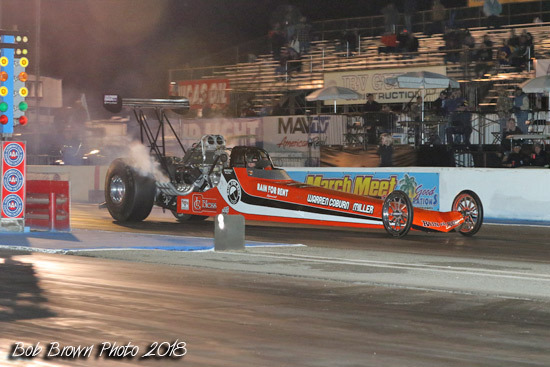 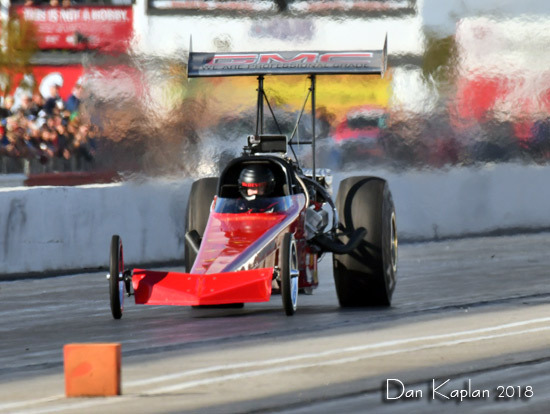 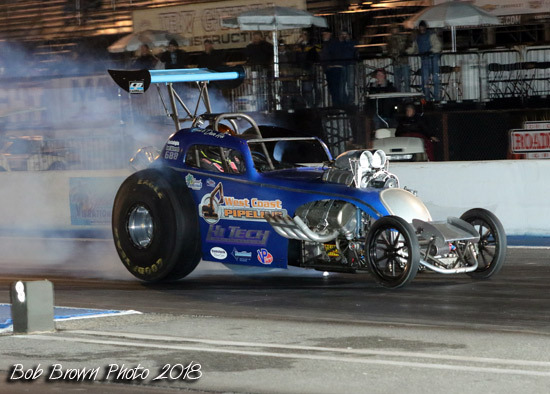 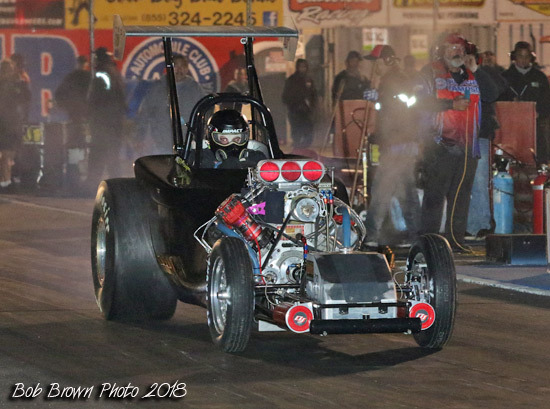 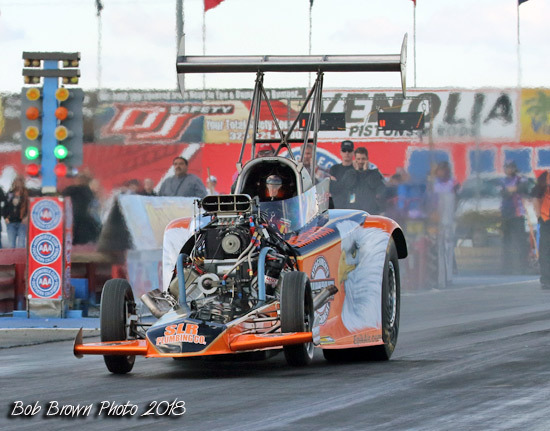 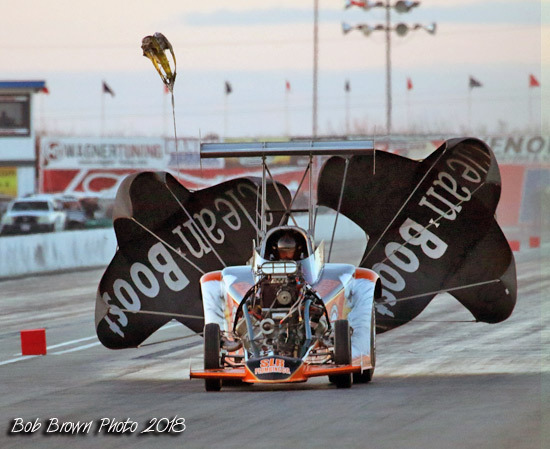 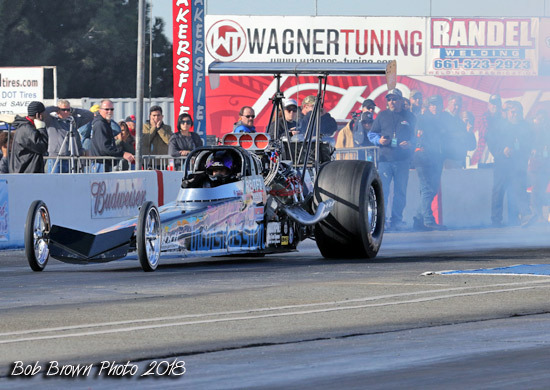 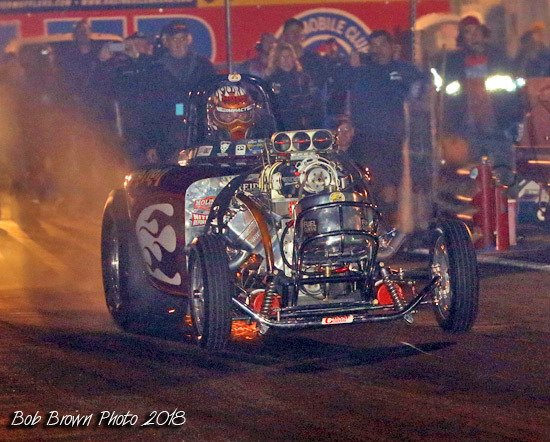 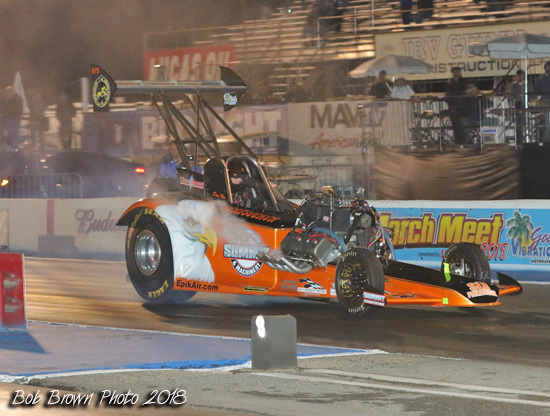 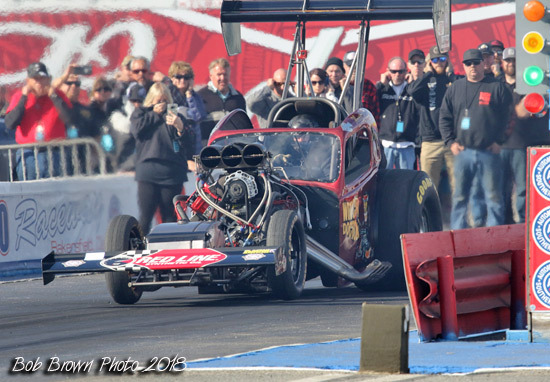 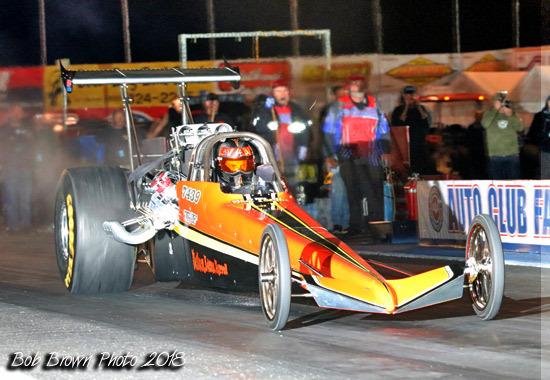 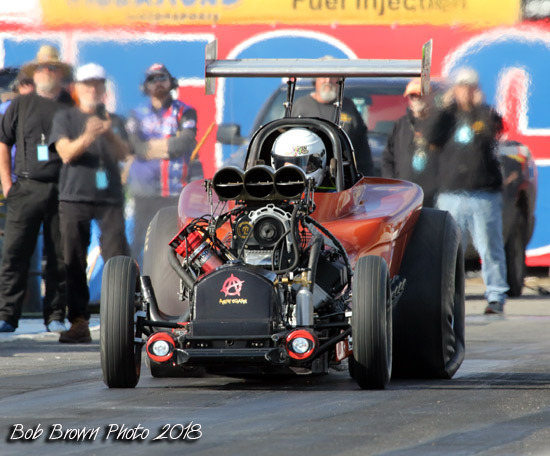 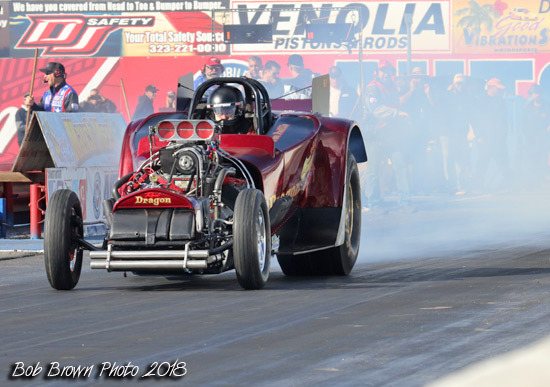 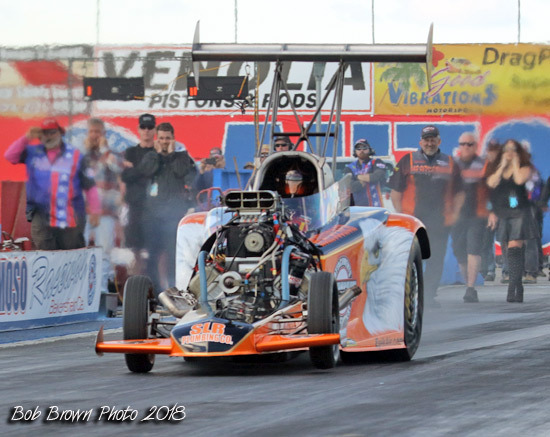 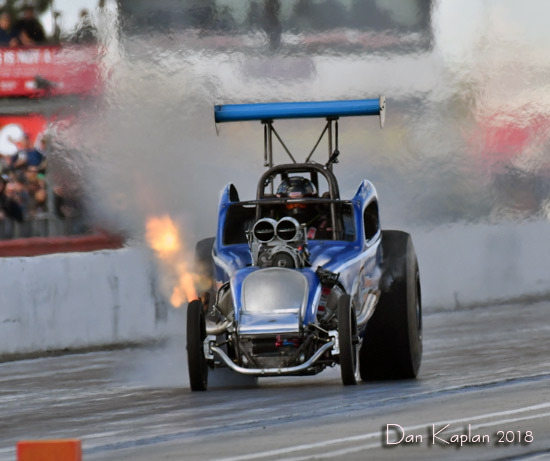 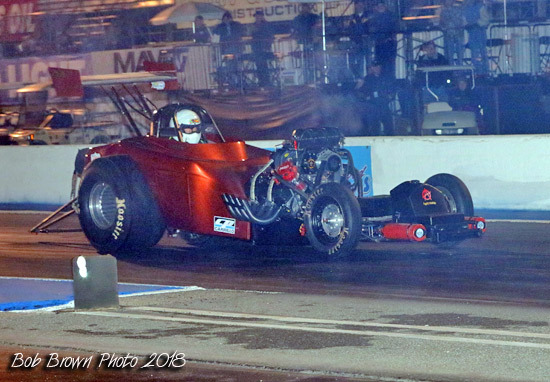 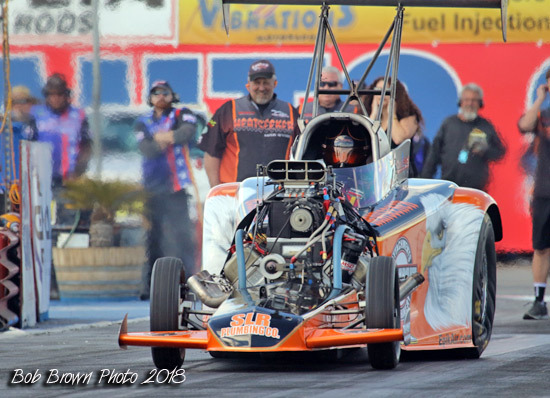 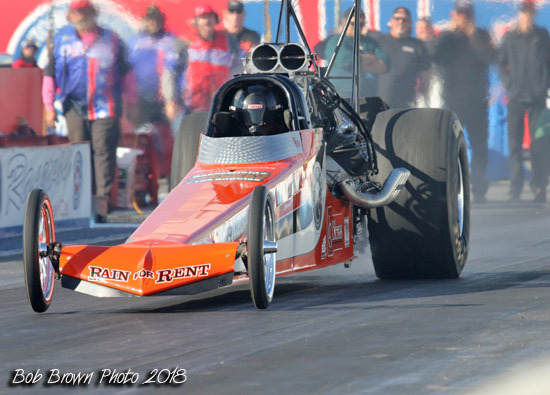 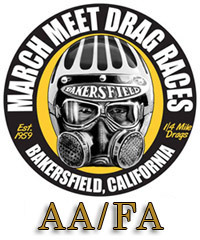 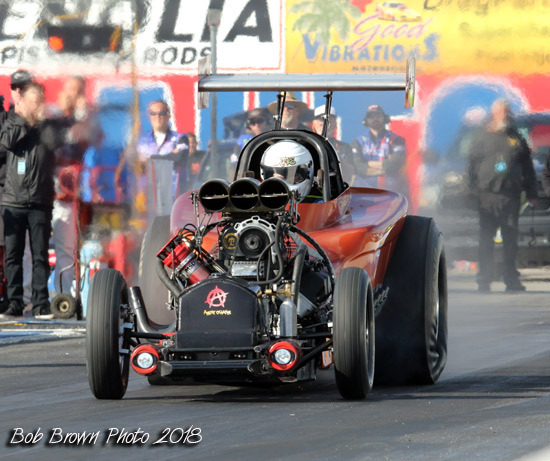 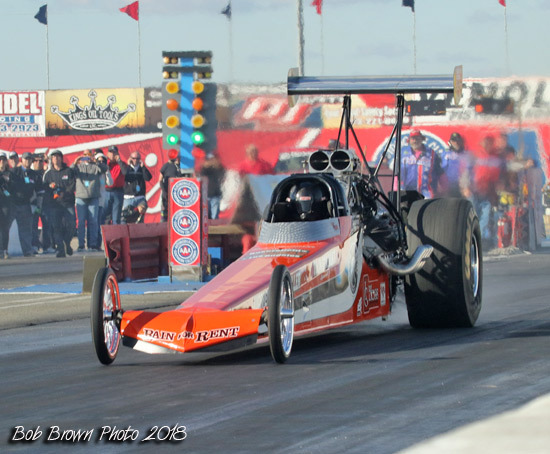 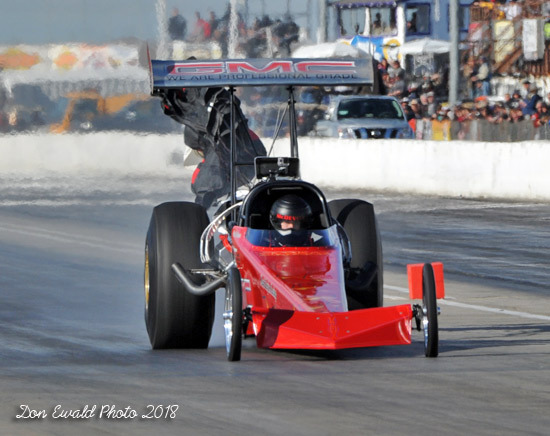 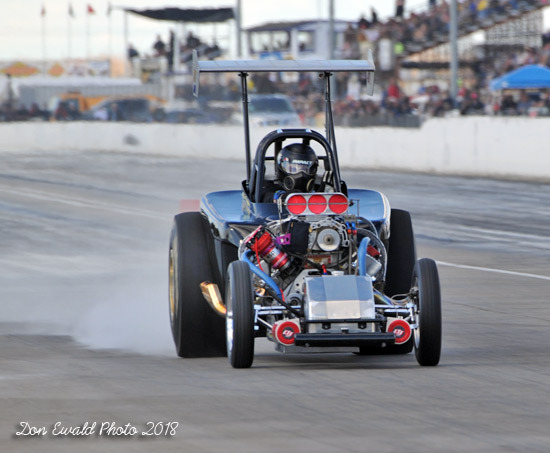 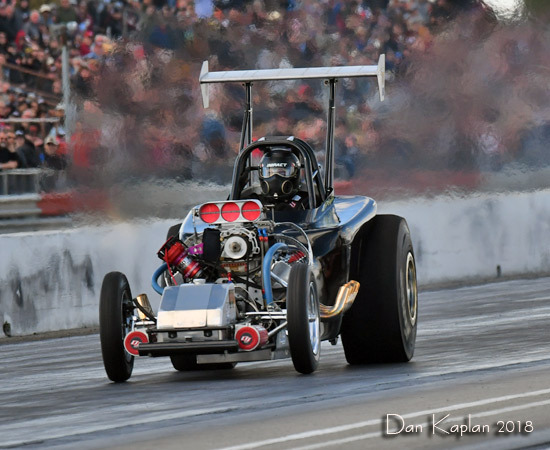 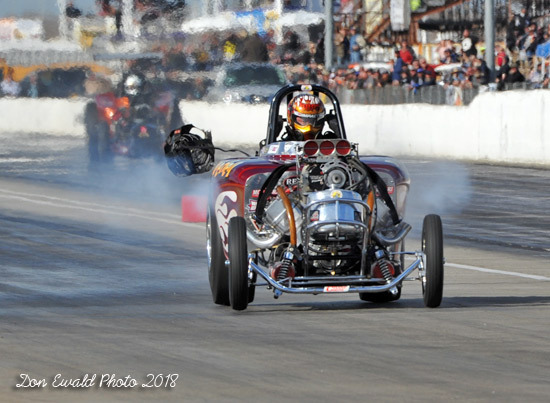 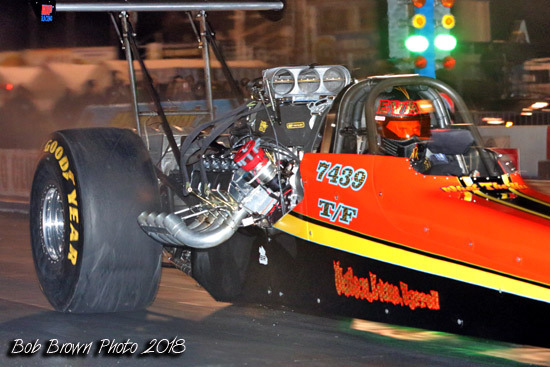 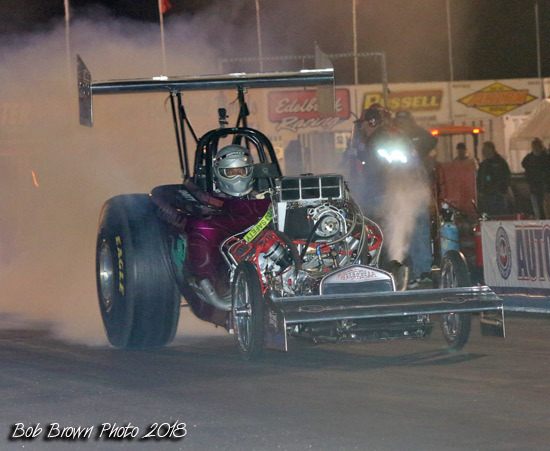 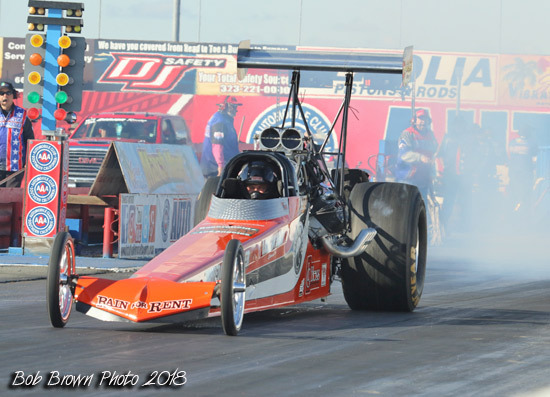 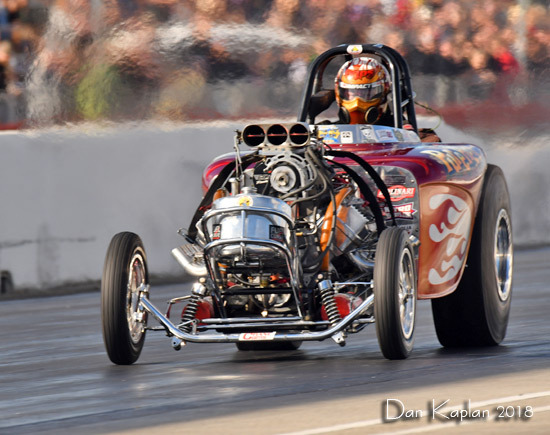 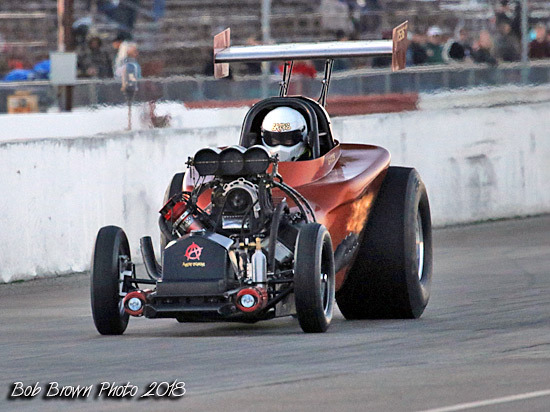 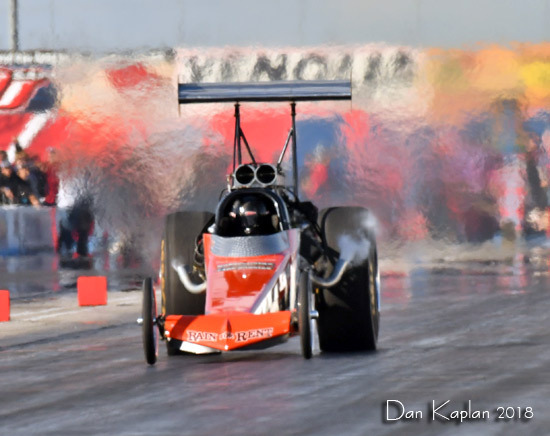 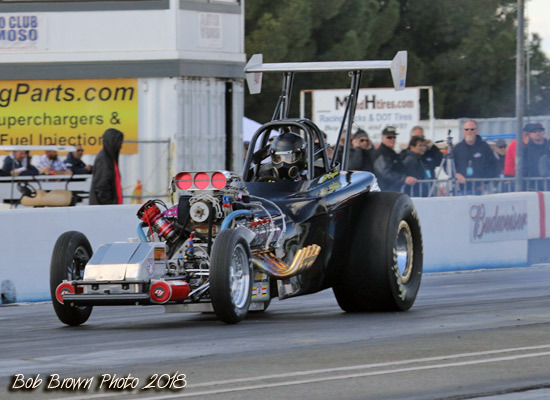 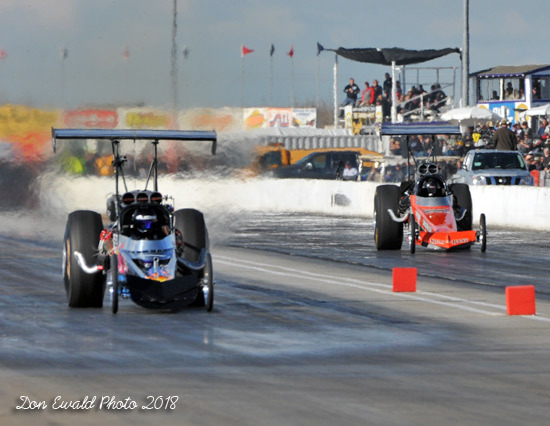 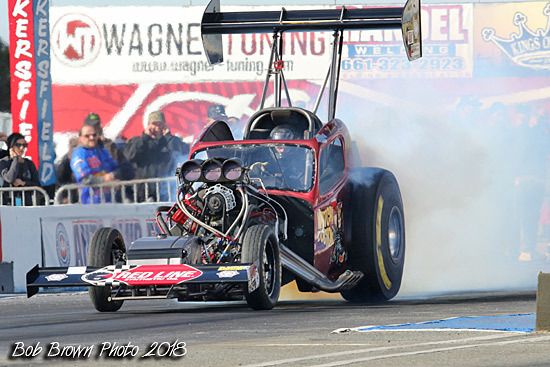 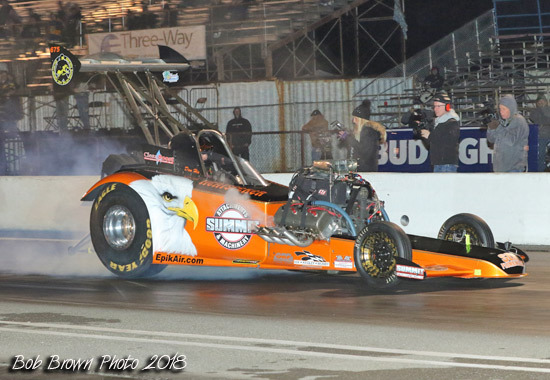 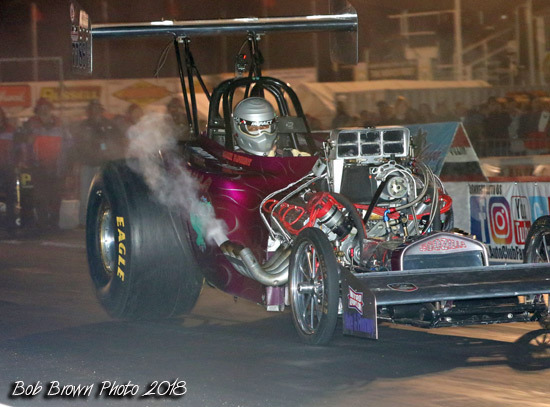 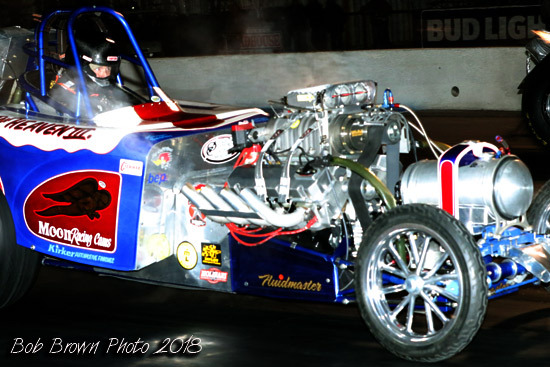 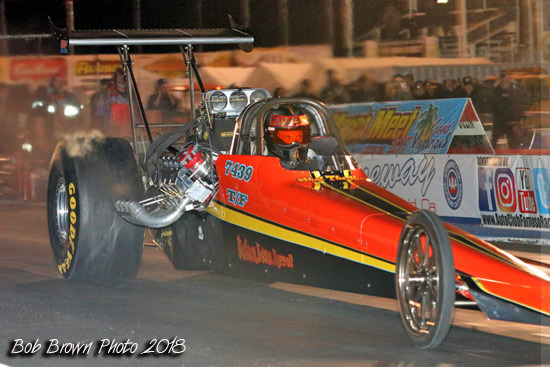 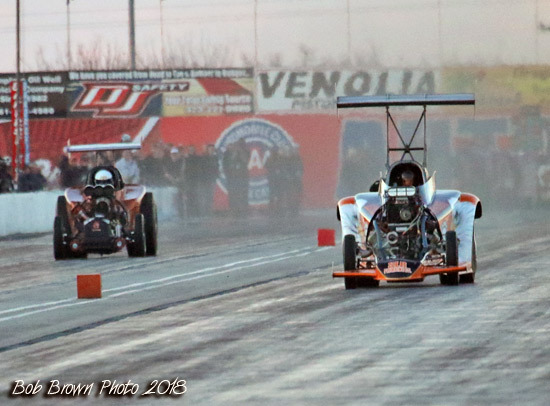 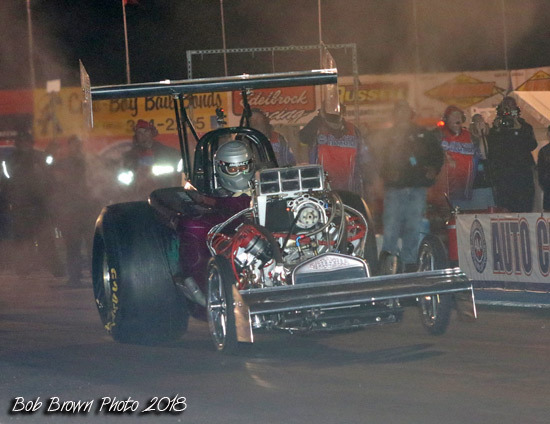 Like the Top Fuel cars, the altereds came into eliminations off the numbers they ran Friday. 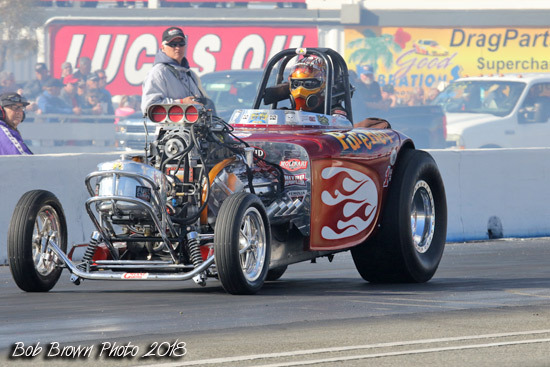 Fortunatly they don't rely on computer data for their tune-ups. 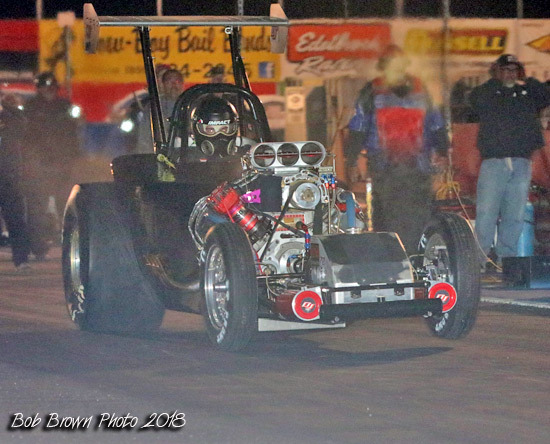 Whynaught left first but by the 60' mark it was all Hix. 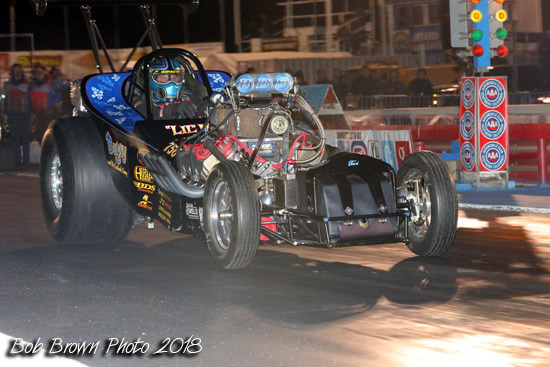 At the other end it was Hix running a 6.112 at 192.11 to a losing 6.207 at 184.14. 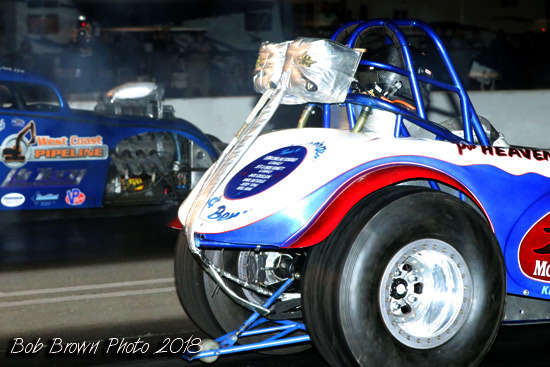 Next pair out was Robert Winefsky and Todd Miller. 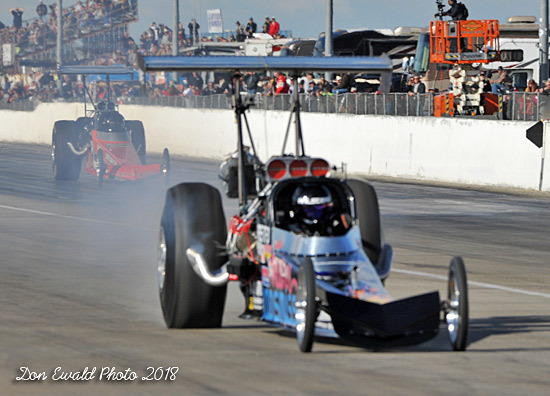 Both drivers had dismal reaction times but Winefsky's 0.196 got him a big jump on Miller's 0.233. 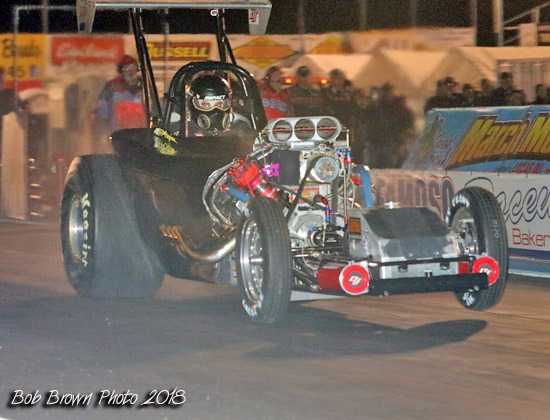 At the sripe it Winefsky with a 6.410 at 215.34 to Miller's 6.620 at 167.97. 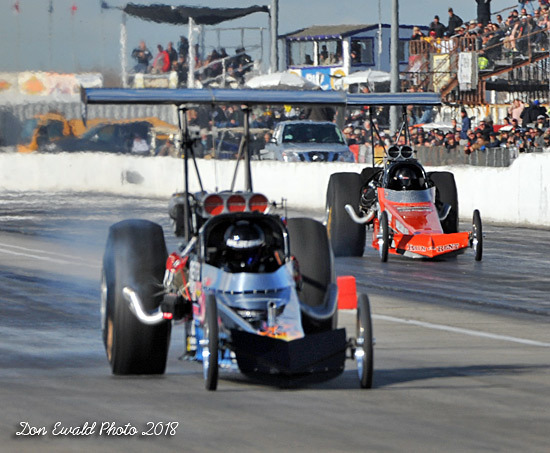 Pair three pitted Eric Gates and Brian Hope. 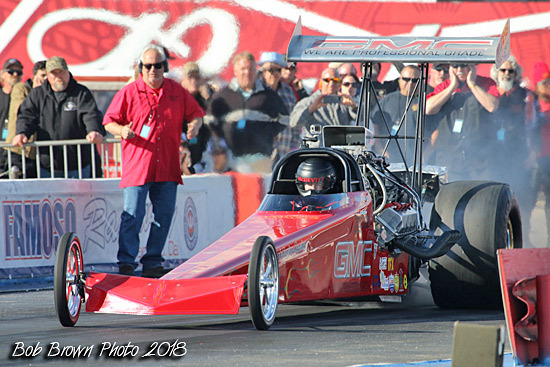 Without a shooter in the right lane all I have is Gates who was dead late against Hope's 0.093 RT to his 0.185 which left him playing catch up. 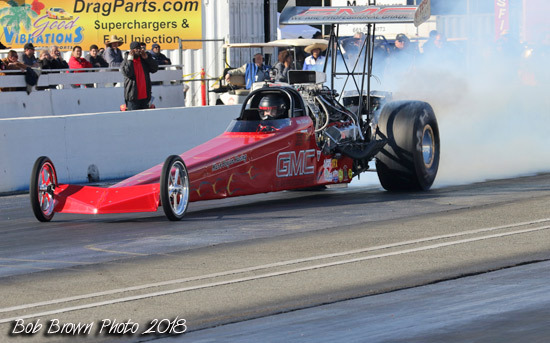 Hope won the battle but lost the war as his 5.989 at 235.43 broke out of the Index giving Gates the win. 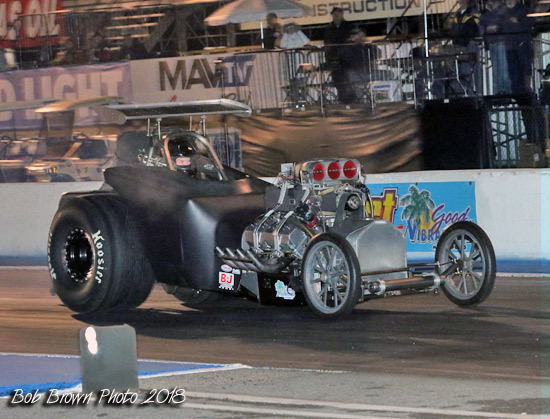 The final pair to see who would move on was Keith Wilson and Tom Padilla. 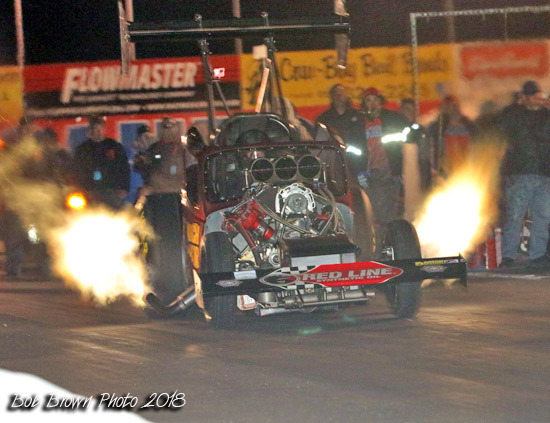 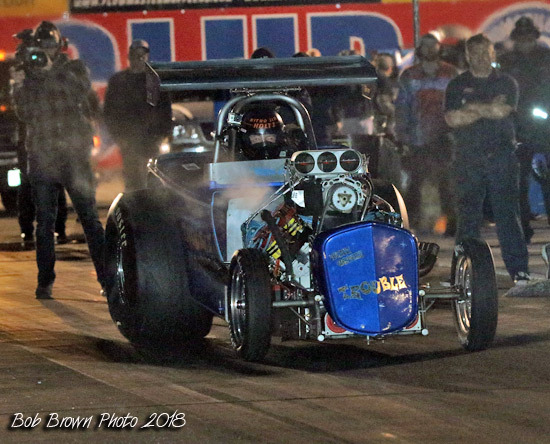 Padilla had problems on the burnout and lost fire. 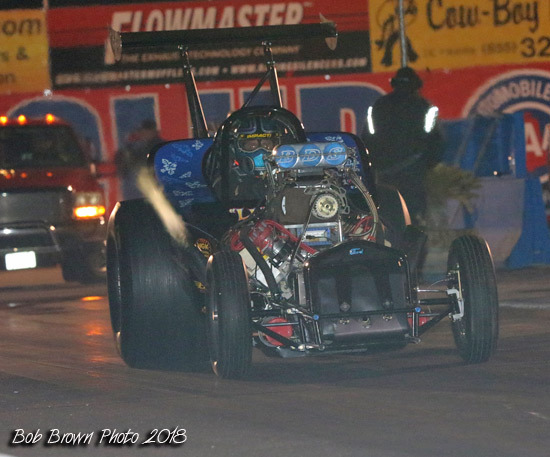 Once he exited the car leaving Wilson to take the win on a single. 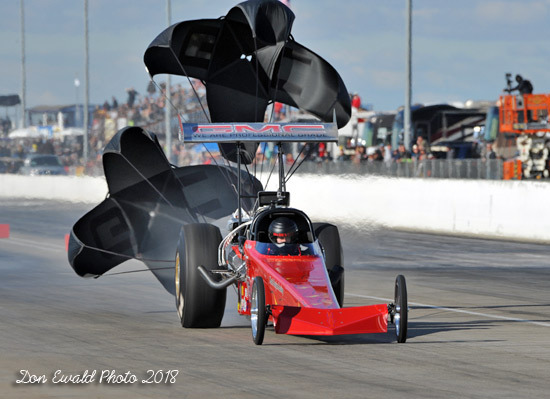 When Dave Gerard was doing the race results for DRC, he would always put in a sentence or two that would have probably explained the broke situation of the two cars (Wilson and Winefsky) that couldnt make the call for R2. 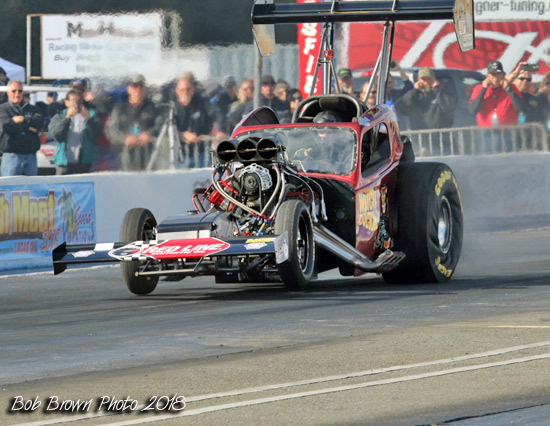 This would have clarified why Hix and Gates went straight to the Final, calling it R3. 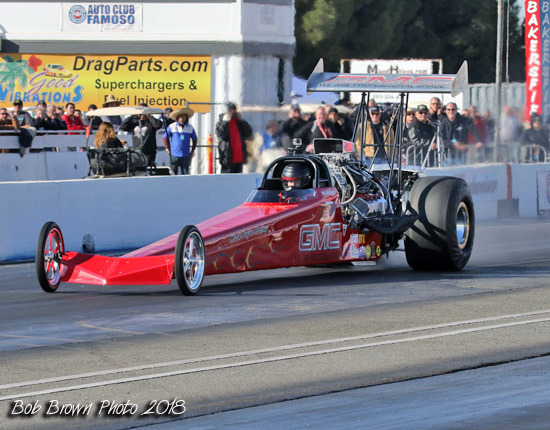 The new DRC guy, Rick Green, does none of that- just the numbers. 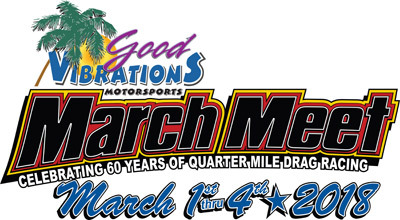 Too bad... could have saved lots of stress for us! 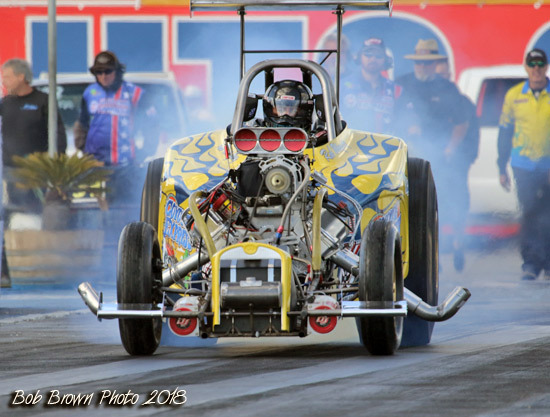 After the so-called round two fiasco it was Dan Hicks who's "transformer" altererd is not a fan favorite and Eric Gates with his more traditional AA/FA. 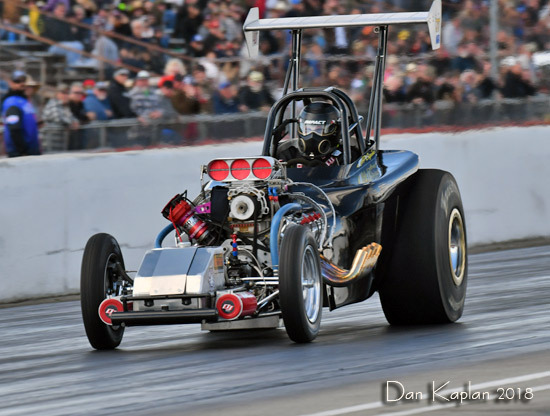 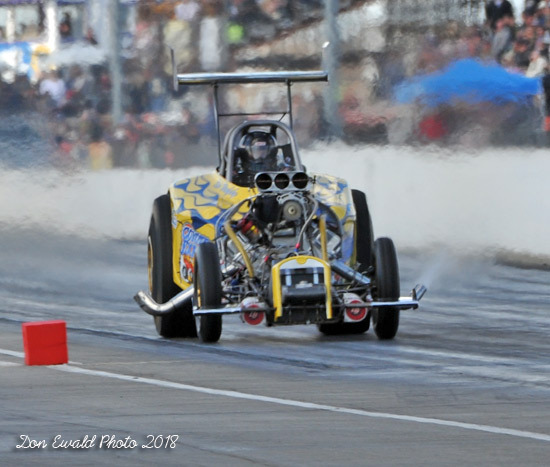 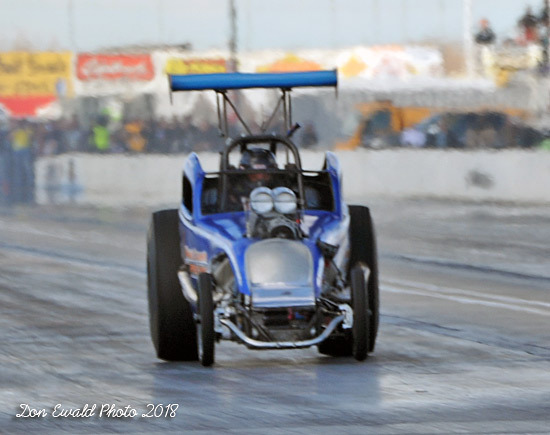 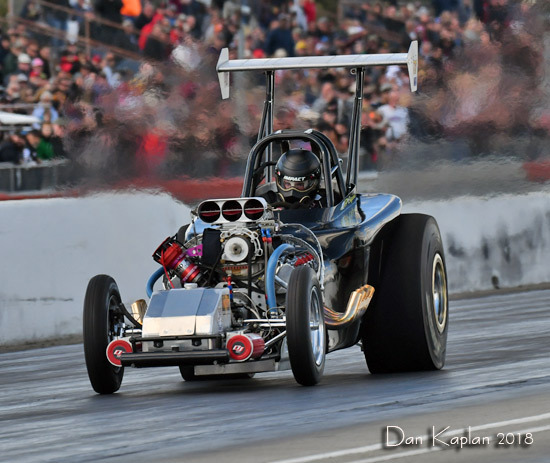 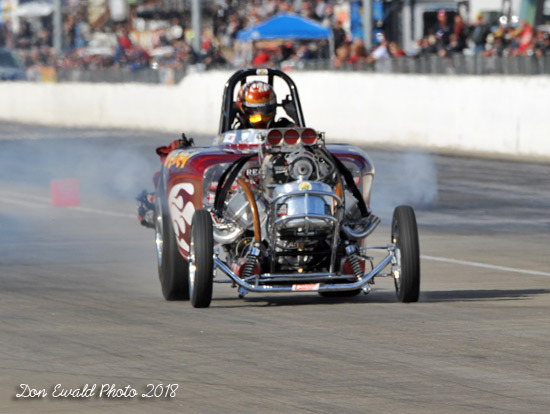 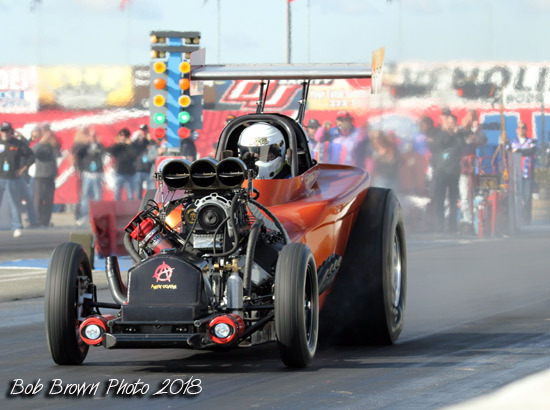 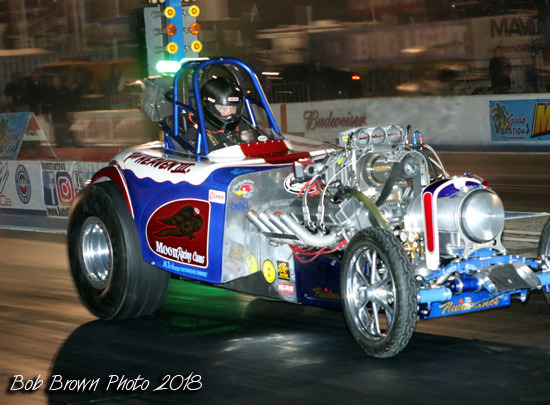 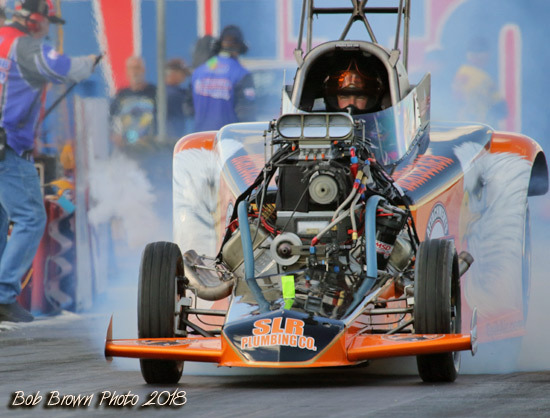 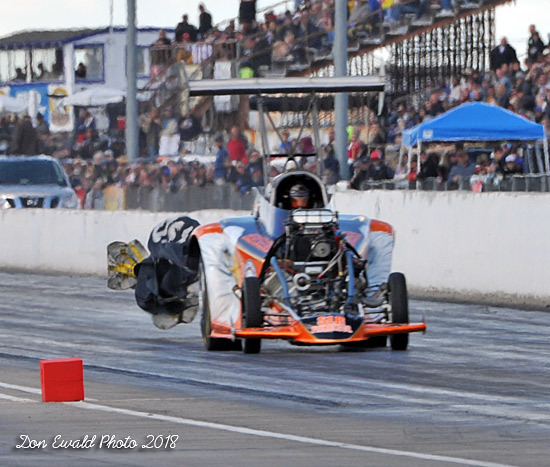 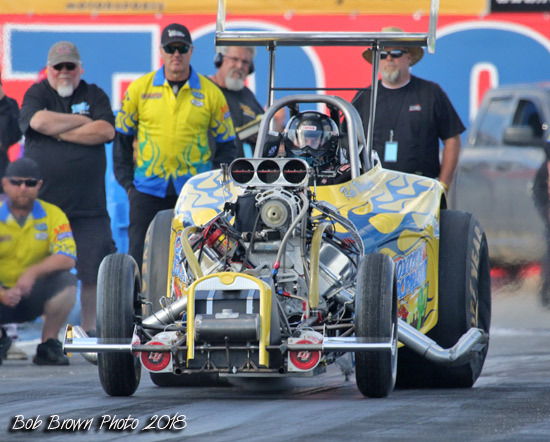 At the stripe it was Hix , who had figured out how to make a five second car a bracket raciter with a 6.301 at 168.14.. Gates threw in the towel with a 8.914 at 93.32. 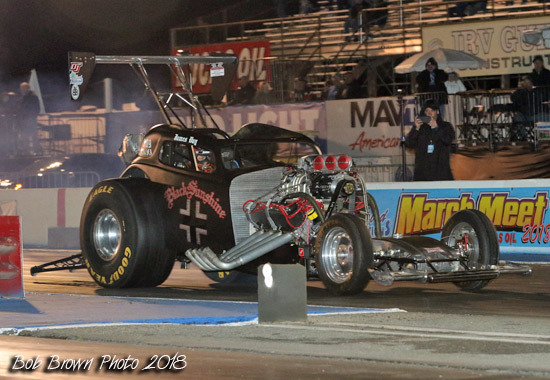 So far this is one of the new nostalgia classes that has not taken off. 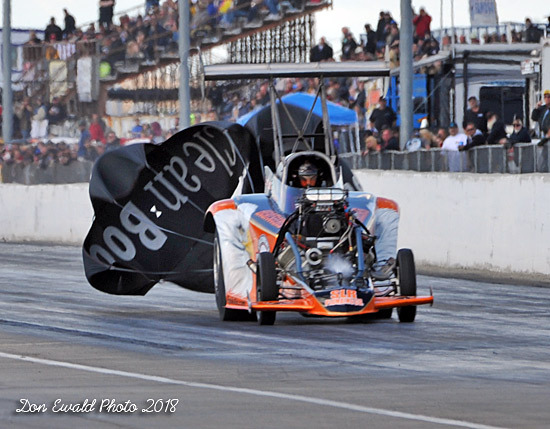 It started with Brad Thompson's tribute car to the late great Ridge Route Terrors, Warren - Coburn & Miller Rain For Rent car. 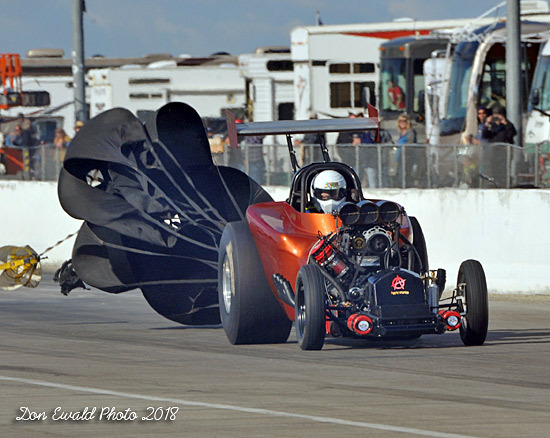 There were hopes several would follow, but only three others did. 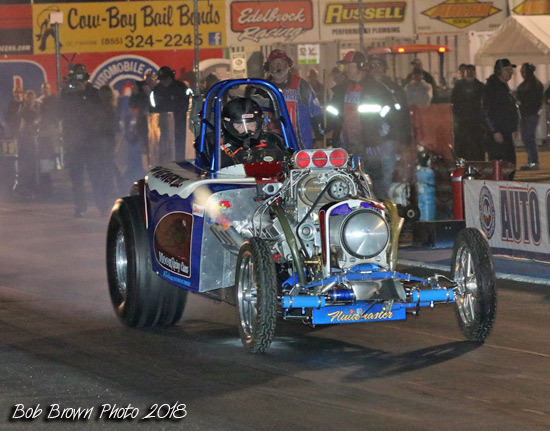 At this point the class is only contested at the March Meet and on special events at Famoso Dragway. 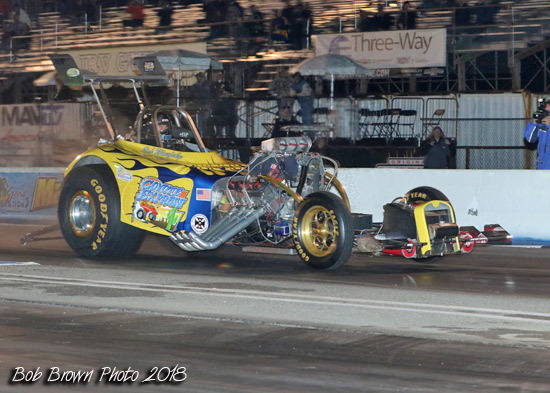 At any rate, it was contested here and like the AA/FA cars they didn't get any favors in qualifying. 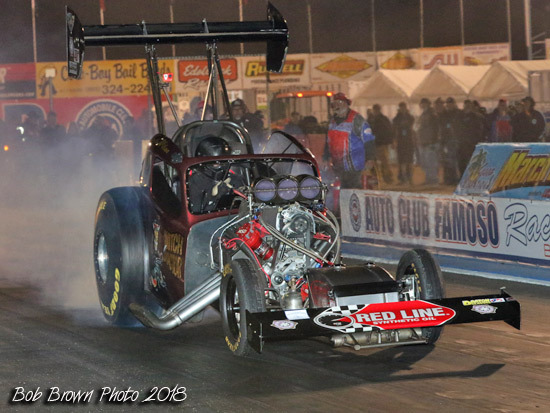 Like the altereds, the RED cars ran on a dark and cold track and only two took the bait. 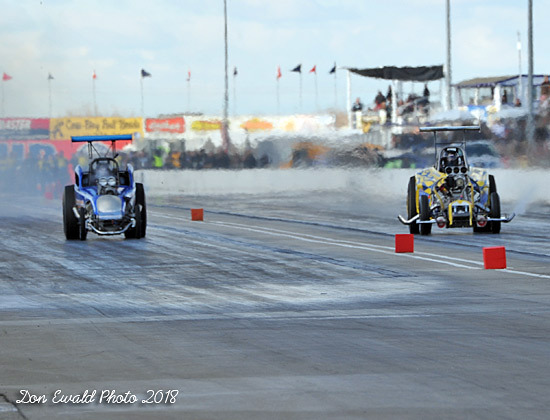 In the left lane it was Brad Thompson and John Evans. 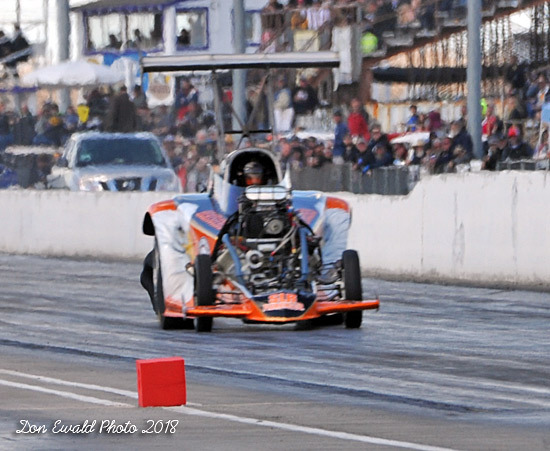 With only 3 cars in the class it was Mike Halstead and Brad Thompson out first. 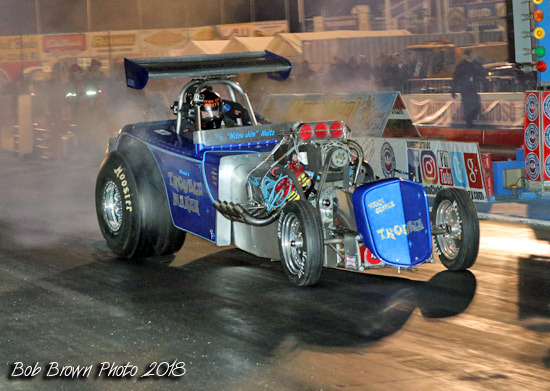 Thompson was done early, Halstead took the win with a 5.546 at 257.14. 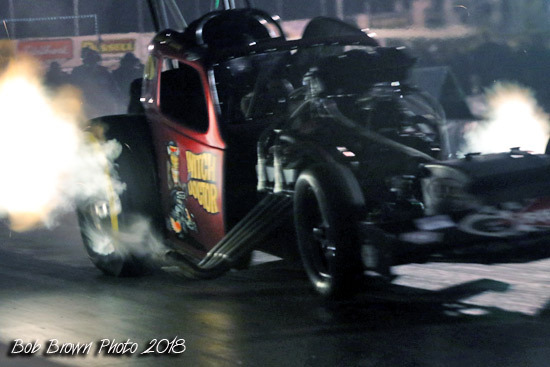 Billy McDevitt got the single. 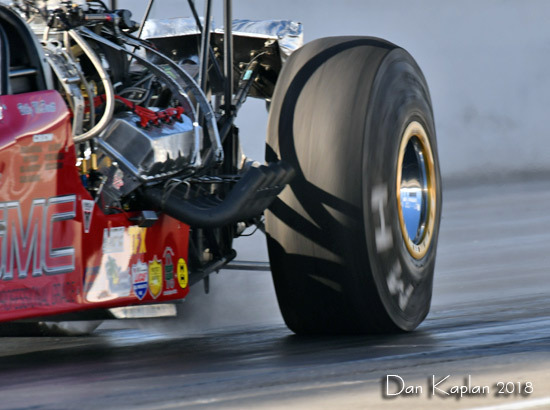 McDevitt carded a 6.189 at 228.58 to go to the final.